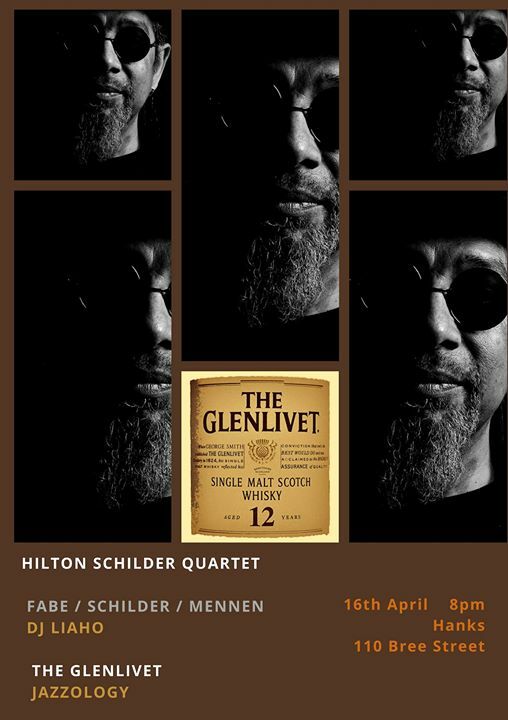 Hank's Olde Irish in association with The Glenlivet and Real Wired Music, continue their Jazz Tuesdays in April. There is no cover charge for any events. Music starts at 7:30pm with DJ LIAHO spinning jazz, soul and funk records, and the event runs until 12pm. Live music starts at 8:30pm. Hanks is situated at 110 Bree Street. There is a special food menu available at Hanks, with a lot of great whiskey and selected beer available. For table bookings [6 people minimum] Phone Jaco 082-047-0228. Please note that bookings must be claimed before 8pm or we will give the table away. Abraham Mennen on saxophones, Carlo Fabe on drums and Eldred Schilder on double bass and Hilton Schilder on piano. The musicality and versatility of Cape Town born Jazz artist, Hilton Schilder, has undoubtedly helped to mould the sound of what is recognised today as Cape Jazz. Multi-instrumentalist, Schilder, who has collaborated with almost every legendary Cape Musician, is recognised, arguably, as one of the most recorded musicians in South Africa, having featured on more than 40 albums covering Genres of Jazz, Rock, Pop, World Music and Classical. Composer and multi-instrumentalist, Hilton Schilder was born into a musical family in Lotus River, Cape Town. He is the son of esteemed South African jazz pianist Tony Schilder (1937-2010) and nephew of Chris Schilder of Cape Town’s groundbreaking jazz-fusion group of the 1970s, Pacific Express. He was given his first instrument, a drum, at the age of three. Hilton’s musical trajectory has taken him through a variety of groups and collaborations in the capacity of both a composer and a performer. He partnered with Mac McKenzie in the mid-80s to form the Genuines, a rock outfit that channeled the folk music of the Cape through punk. The band’s first two releases on the Shifty label tethered them to the broader Voëlvry movement and cemented their legacy in the history of South Africa’s alternate music scene.